Jellybean had a sleepover at a friends house this past weekend and PB went down for a morning nap. The dishes were done and laundry was not taking over the laundry room. So I decided to take a moment for myself. I had coffee, knitting and a knitting podcast playing. My Mini Solutions Scarf was just the right amount of soothing garter stitch for a slow knitting moment. I managed to make good progress on the first color section before PB woke up. And then at bedtime I worked through the rest of the first color. I’m ready to wind up the next mini skein and work the color change row. Working with the Treasure Goddess MCN set is just SOOOO luxurious. I may or may have fallen asleep with my knitting in my lap right after this photo was taken. I spent too long looking at the fire dance and exhaustion took over. Oh well, I guess there are worse places to catch 40 winks! Next up on my breast pumping/lunch project rotation is my Mini Solutions Scarf. You can remember here that I misread the pattern and had to rip out the whole Christmas Eve cast on progress. So this past week I decided to get back in the saddle. This little wedge is one 45 minute lunch worth’s of progress. And its WAAAY better looking than my first attempt. And how cute is this subtlety tonal yarn?? Or is variegated? I really stink at deciphering….nonetheless its pretty! Now I’m cruising through all soothing garter stitch until I run out the first mini ball of yarn. This super tired working momma sure loves her some garter stitch. It keeps my hands busy and my brain pleasantly calm. I loved the Lemonade Shop’s Stormy Day yarn so much that I couldn’t wait to add it to my memory blanket. 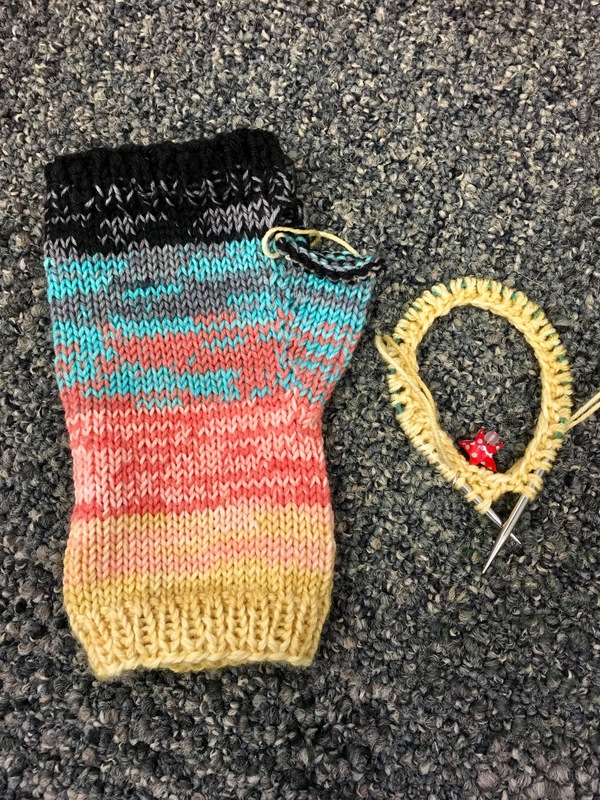 I wanted to make sure I got my square done before I got started on the Rainbow mitts too. I haven’t touched this in awhile and I kind of forgot how beautiful this blanket is. I have an itch to work on this, but it won’t earn me any points in the football KAL I’m playing in so I have kind of let it sit in my bag. My better angels may win out and this may see some action this fall. Especially after I show you some mini madness I have earned. But that needs to be it’s own post. For now I’m going to pet my pretty blanket and snuggle under it. I may or may not have splurged on a little push present for myself. PB came so early that I didn’t have time to get my prenatal massage that my husband arranged. So I did a little yarn shopping to aid my surgical recovery. I picked up some GnomeAcres mini skeins for my memory blanket and a OOAK skein from Yarn Ink. 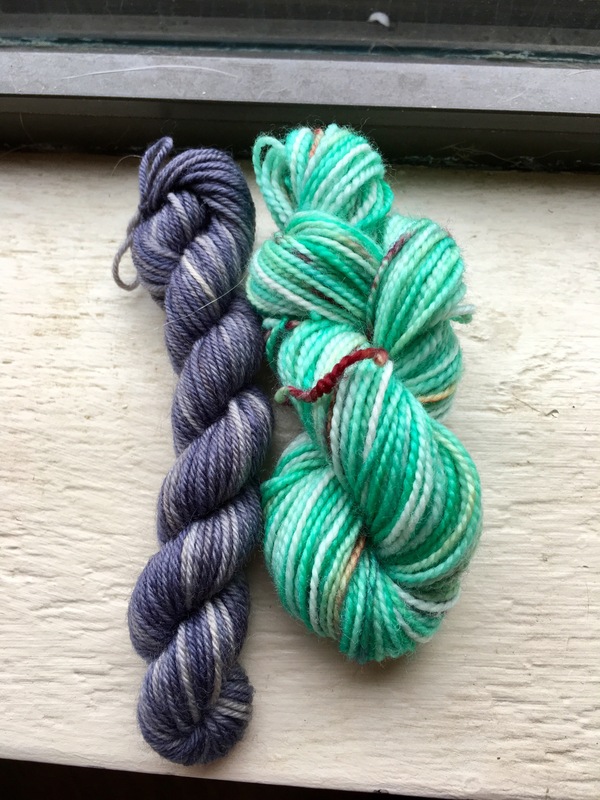 These are both dyers I have not worked with before and have been coveting for a long time. Yesterday I talked about the Pigskin Party KAL December interception all about minis. I had another project cooking related to minis. I scored a little mini of With Pointed Sticks in the Big Head Little Arms color way to match the skein I won from the Prairie Girls. They are different due batches so o couldn’t use them together. So I decided a cup cozy was necessisary. 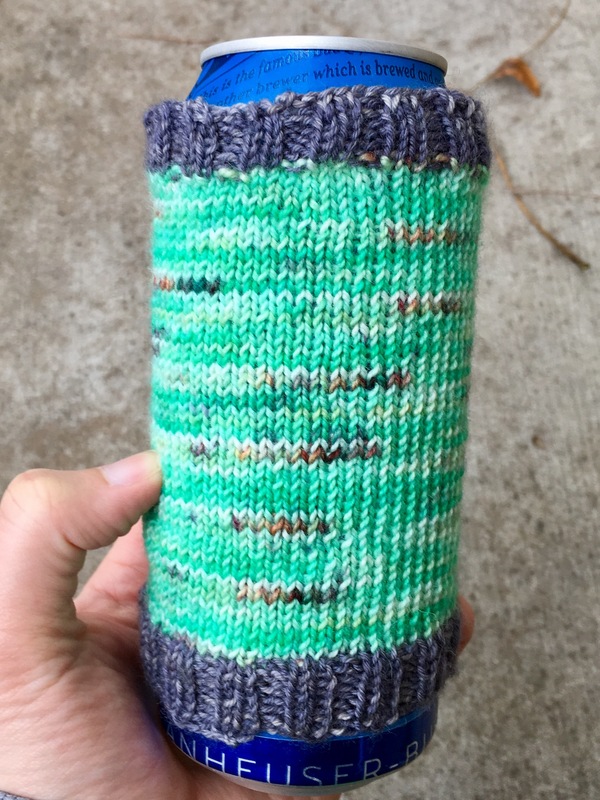 I pulled a unlabeled skein of grey for contrast and went to town on the Easiest Cup Cozy by Gracie Kral. And I finished in a flash! My Rav notes have all the needles and yarn details for those inquiring minds. The Down Cellar Studio Pigskin Party is hosting a special December interception and giveaway. It’s all about the minis! So while waiting for my swap packages to arrive I pulled the One Twisted Tree mini skein set in the Beachy color from my stash! And after some pattern diving in Ravelry I fixated on the Gradient Mitts by Christa McCurdy. And boy are these addicting! I finished the first one (sans thumb) and started the second one. 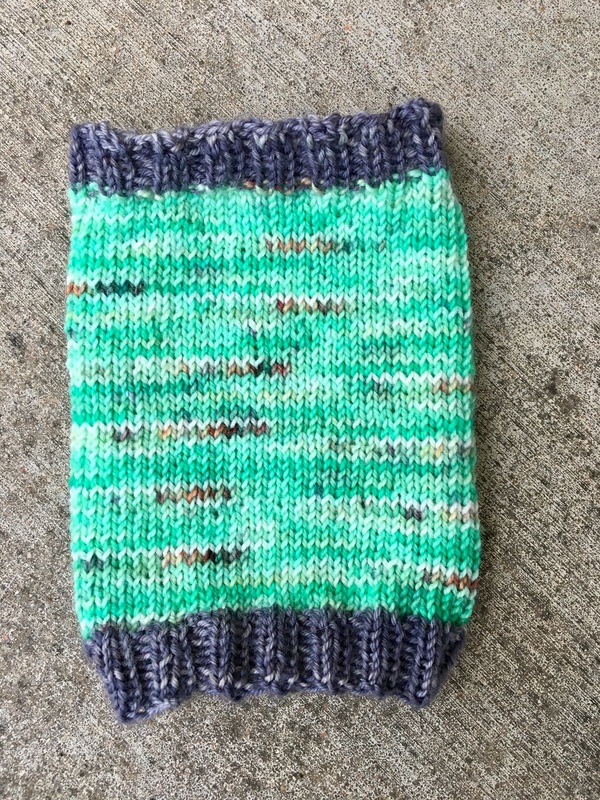 The yarn is held double to achieve the gradient effect. Between the two strands of yarn and the fact I chose to stay on size three needles, this fabric is dense and warm. I love it! The mini set was short one color and my husband suggested black. Not a color I would normally use in this case. But I kinda dig the stark contrast from beginning to end. Points for the hubby! Now on to the second one! Happy Knitting!! In case you haven’t noticed from my blog posts I’m kind of obsessed with the Down Cellar Studio’s Pigskin Party KAL. 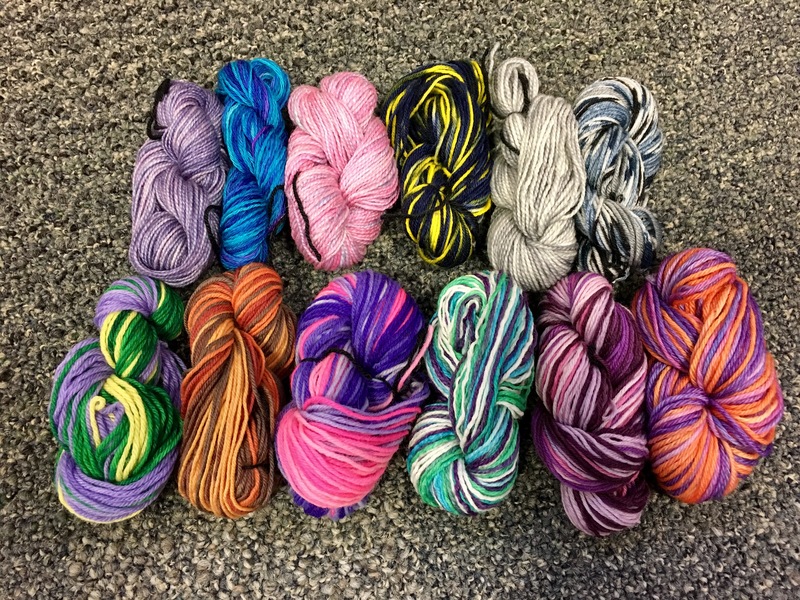 In a recent Ravelry thread the KAL moderators floated the idea of a mini skein swap. I jumped on that hard! The idea is to pick 12 mini skeins of sock yarn and mail out to 12 knitters and then receive 12 mini skeins from 12 knitters. I don’t have to mail them for a couple of days but I’ve already rounded my skeins up! I made a Rav page for the swap in case you were interested in the details. That’s 513 yards of yarn in those pretty piles! I can’t wait to see what comes back! 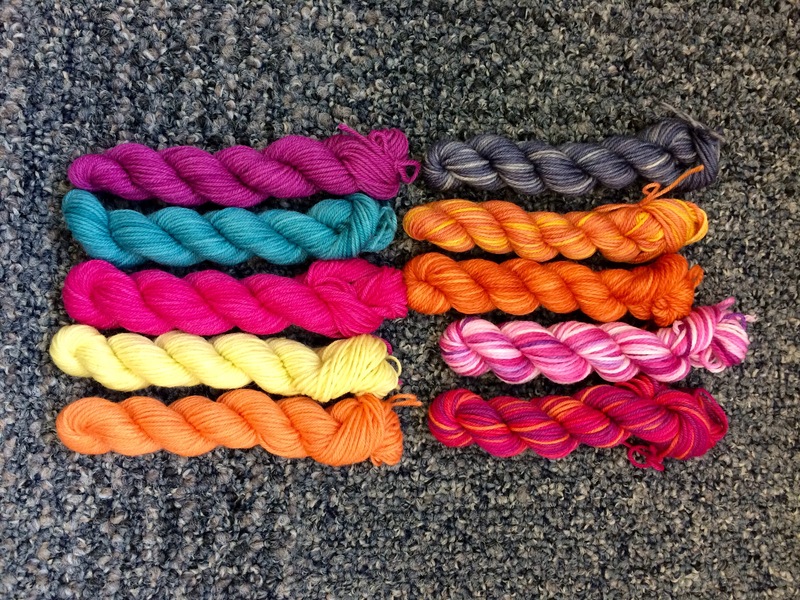 I fell down the Etsy rabbit hole and found more mini skeins…. These are more minis from AndreaInBlue on Esty. I needed some solid colors to break up my stripey and variegated blocks. That’s totally logical right? Just don’t tell my husband….